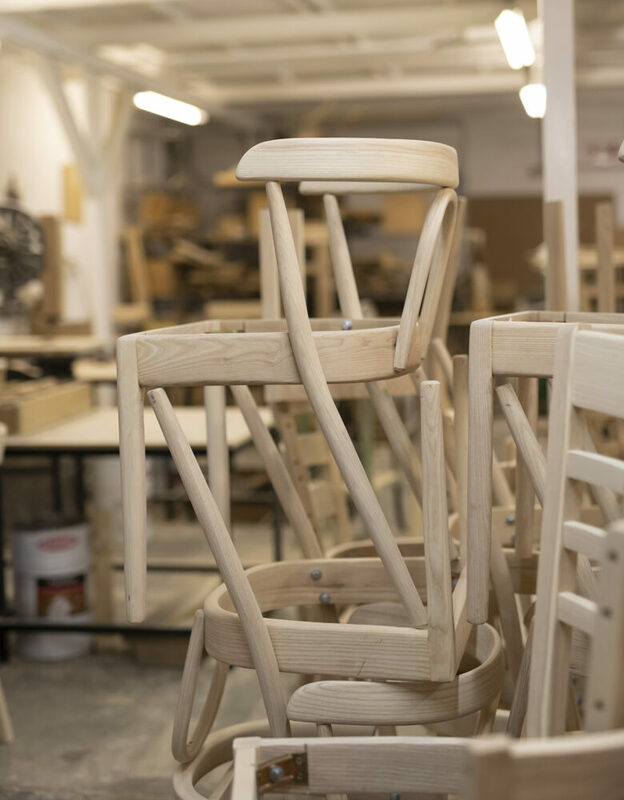 Once the customer has decided on the design of their chair – whether it be an occasional chair, dining room chairs, kitchen or bar stools – the journey relocates to the Woodbender factory. Here, the Ash timber we source from sustainably-managed forests in North America is handcrafted according to an old-world tradition. The history of the bentwood process is a fascinating one that dates back to the 18th century, when it was used in the creation of the Windsor chair. It was, however, Austrian cabinet maker Michael Thonet who really brought the process’ possibilities to life in his iconic No.14 chair, released in 1859. According to Designmuseum.org, the chair was so popular that by 1930 fifty million had been sold, including one to Picasso and another to Einstein! A replica of the No.14 chair, manufactured in Imbuia, that was the first item of bentwood furniture to leave the Woodbender factory in 19xx. The inspiration to recreate it was sparked when Shirley, who was working in Cape Town at the time, came across Thonet Bentwood & Other Furniture: The 1904 Illustrated Catalogue, at the library during her lunch hour. The construction of the chosen piece is undertaken by our team of craftsmen, many of whom have been with us for more than a decade. They receive on-the-job training in the specialised process of wood bending, which preserves the integrity of the wood and ensures the longevity of the item. Each piece of machinery our team works on has been built by Charles and his father, John, mostly from photographs in books – Google wasn’t around when they started the business 30 years ago! As mentioned earlier, all of our furniture is crafted from Ash timber. Why Ash? This particular wood is known for its strength and durability, which make it the perfect choice for furniture that’s made to last. It’s also aesthetically beautiful and its light colour make it the perfect choice for tinting. Once the individual components of the customer’s chair have been crafted and assembled, it’s time to move on to the spray booth, where the tint is applied and the chair begins to take on its own unique character.